Do Cats Jump in Water? Turkish vans often love to swim. If you've ever tried giving kitty a bath, you've probably discovered why people say cats hate water. He may impress with you with gymnastic abilities as he tries to avoid going for a dip. However, most cats display a fascination with the wet stuff, and some positively love to swim. Your kitty has probably never spent a day outdoors. Even if he's allowed, you probably keep him indoors if a storm is brewing. Since humans first starting domesticating cats, they've shielded them from the elements. The only times your kitty has had to deal with getting wet is probably the rare bath, which wasn't exactly his idea of a good time in the first place. Since they don't have a lot of experience with water, most cats have never developed a desire to be in it. Most of his experiences with water, like getting sprayed with a water gun when he attacked your blinds, aren't pleasant ones. This has lead most house cats to abhor getting wet. Instinct plays a part, too. River-dwelling predators, like crocodiles, are some of the few predators big cats have. Avoiding the drink is a good way to keep himself safe. While most cats won't willingly opt for a swim, that doesn't mean they totally hate water. Most cats enjoy playing with water. If you've ever had a leaky faucet, Kitty has probably spent some time taking a sip or swatting at the drops. Perhaps he likes to attack your shower curtain when the the water's running. This is because cats find running water fascinating. In the wild, running water is less likely to contain contaminants. Wild cats are more likely to drink from a stream than from a pond. Still water is much more likely to contain bugs that could make kitty sick. 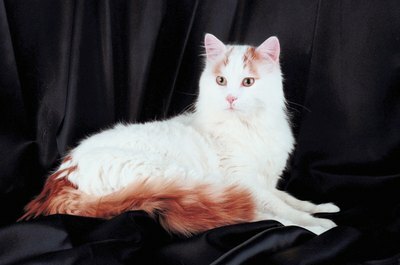 An exception to the rule is a breed of cat called the Turkish van. These cats, which originated in the Lake Van region of Turkey, often love to go for a swim. They'll often jump in the tub or dive in the pool, gleefully playing in water. This has earned them the nickname of “swimming cats.” They also are known for being hypo-allergenic. So if your allergic to cats and want a feline who'll play in the pool with you, you might consider a Turkish van. Some of kitty's wild cousins will enjoy the water. Tigers, and other cats who live in warm climates, are often known to go for a swim on a hot day. The Asian fishing cat loves the water, and even has webbed paws that make him a skilled swimmer. Cats in cold climates, like lynxes and snow leopards, frequently avoid the water like their house-cat counterparts. This is because getting wet will cause them to quickly lose heat, not good in a snowy environment. Animal Planet: Do Cats Really Hate Water? Care2.com: Why Do Cats Play with Water? Can Weimaraners Live with Cats? What Is the Difference Between a Manx Cat & a Lynx Cat? Do Rat Lice Affect Cats? Do Parrots Pair for Life? Does Seeing Birds Make Cats Happy or Anxious? What Frequencies Do Cats Hear?